Went to Brother Jimmy’s this week and it left me feeling kind of luke-warm. On one hand, their Wednesday night special – 25% off with a Southern State ID – is a good deal. On the other hand, the prices are high and 25% really only comes out to a couple bucks. If you’re really trying to make your money go a long way you might consider their other Wednesday night special – the “White Trash Menu” – an All-You-Can-Eat selection of Fried Chicken, Meatloaf, Rib Tips, Mac and Cheese, Hush Puppies and something else for $13.95. I like variety but I’m not so into the whole AYCE thing when its more than a regular portion on the menu that will generally satisfy me. Maybe one week I’ll fast for two days and then try it. 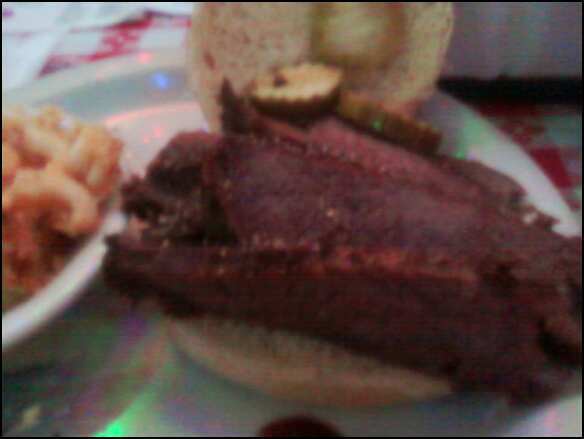 I had the brisket sandwich, which is $10.75 (minus 25% on Wednesday). One nice thing is you have the option of lean or marbled. My waitress persuaded me to go for lean but I wished I had gone for marbled, since it was kind of dry. The flavor of the meet was pretty OK, not great, but would have stood on its own without sauce. Unfortunately the bun was way too thick and dry, so I had to completely soak the thing in BBQ sauce. I seriously hope that this bun was just stale and not what they normally serve, but my waitress assured me that they’re fresh daily. 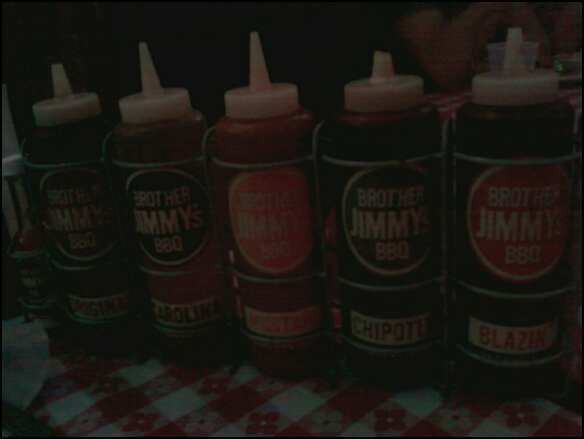 One nice thing about Brother Jimmy’s is the variety of regional-style sauces on the table. There are 5 Sauces: Chipotle, Blazin, Orignal, Carolina (Eastern Carolina Style Vinegar Based), and Mustard Based. The Blazin is very hot and pretty much destroys the flavor of any meat you put it on (and I LOVE spicy food). The original is actually a pretty good Memphis style sauce and goes great with the brisket. 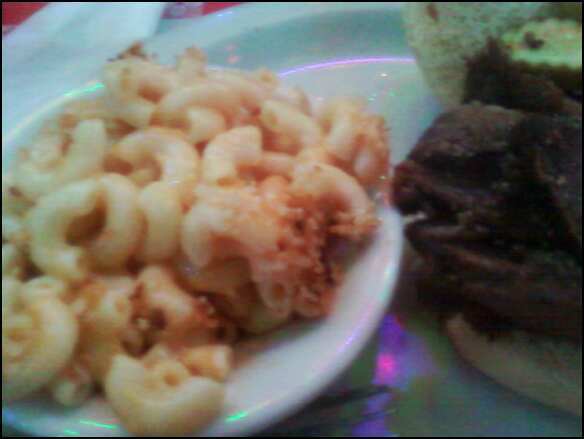 I opted for Mac and Cheese as my side. It wasn’t as good as Dinosaur’s but pretty good in its own ways. It wasn’t super cheesy but it was light and buttery, and the bread crumbs were a nice touch. This place goes through great lengths to try to feel authentic. I’m just not sure if they’re going for a specific regional identity or just taking bits from all over, but if I had to pick one I’d say it is Carolina style. They even have Cheerwine, a cherry soda that most Carolinians know and love, but is rarely found elsewhere. As a regular at Brother Jimmy’s (not by choice– it’s the only bar that shows every Tar Heel football and basketball game), I have to say I agree with everything you said about the generic feel and too-high prices. Personally, I don’t really find the Blazin’ sauce spicy at all, actually, and I use it every time. I also have to complain about the “Carolina style” sauce– it’s about 9/10 vinegar and 1/10 seasoning, which is totally wrong and probably terrible (I’ve never ventured to try it). However, they do have delicious fried pickles (frickles), and the Saturday 25 cent hot wing special is nice, even though the wings aren’t really that great (especially on Saturday, when everyone is ordering them). Yeah the Carolina Style is pretty much a worthless novelty. I find it interesting that they have it at all since the only time I’ve ever seen it is in Eastern Carolina. I guess its not that the Blazin’ sauce is that spicy, its just that it seemed to cover up the flavor or the meat rather than enhance it. I used it on the mac and cheese and it was fine for that, since it didn’t have that much flavor to begin with.